Factory Sealed Panini Threads Basketball Hobby Box mit 24 Packs Per Box, 5 Cards Per Pack. 3 Autogramme und eine Memorabilia Cards per Box ! Alle 2012/13 Boxen haben die Rookie Draft Class von 2012 und 2013 !! Produktinformationen "2012/13 Panini Threads Basketball Hobby Box NBA"
Autograph sets include Rookies, Team Threads Signatures, Rookie Team Threads Signatures, and Private Signings. Memorabilia cards include Authentic Threads, Prime Authentic Threads, Triple Threads, and Prime Triple Threads. After a year away, the popular Threads brand returns with 100 rookie Cards printed on wood and signed on-card! Look for Team Threads die-cut jersey autographs! Team Threads Signatures: These die-cut jersey card gems with signatures are back again! Signage: Showcasing on-card autographs of the NBA's best players! Century Greats: Features a new and unique design along with some of the most recognizable and historical NBA players. Authentic Threads: Find short-printed memorabilia cards at the rate of one per box! Prime versions as well! Rookies: Look for on-card autographs of the latest rookies on newly-designed wood cards. 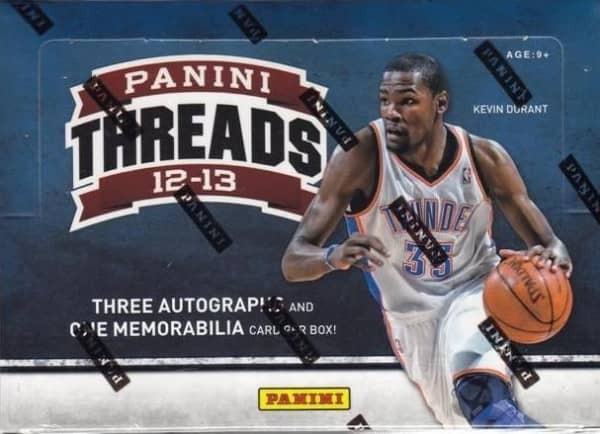 Weiterführende Links zu "2012/13 Panini Threads Basketball Hobby Box NBA"
Fanbewertungen für "2012/13 Panini Threads Basketball Hobby Box NBA"